The quest system allows users to build narrative structures in space. Usually driven by interactions with NPCs in your regions, quests can lead users through gameplay or learning and training modules, or through tours, stories or other step-based user engagements. Quests are depicted by a blue exclamation mark above a Quest Giver which can be any type of clickable GameObject (with a collider component). 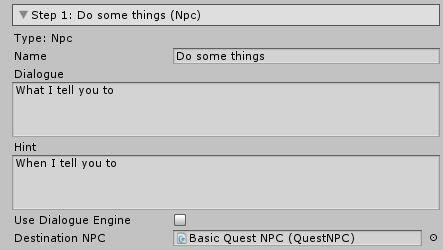 Clicking on the Quest Giver shows the first Quest Dialog Box (the first Step, numbered 0 in Unity) with a Start / Cancel option. Quest Dialog Box shows the Name and the Description of the Step (see below). As soon as the user accepts the quest, next steps are shown as a blue question mark. On the left of the screen, below the radar, The Quest Name (Quest Designer Component) appears with the number of steps and the hint to reach the next step. Hints are related to a future step the user needs to reach (usually the next step). So the hint needs to be written on the Step the user needs to reach. For that reason, there is no need to write a hint inside step 0 (the opening step), unless for some reason the quest brings the user back to the Quest Giver. All quests are started by the user clicking an object, the so called Quest NPC which presents the quest. The user opts-in to the quest. To turn any object in your scene into the Quest NPC, add the Quest NPC component to it. You can use a humanoid NPC. Use the Statue component object, rendering the NPC as a character. Then add the QuestNPC component to that. You can add the Quest NPC component to any object with a collider on it. The user clicks on that object to start the quest. Quest NPCs are placed into the Destination NPC field in any Step Inspector of your quest (see below). 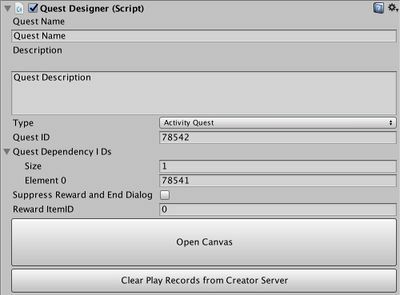 Create an empty game object in your scene, set it to location 0,0,0 and add the Quest Designer game component to it. Give the quest a name and a description. Daily : users can play it once every day. Main : users can play the quest only once. Side : can only be triggered by another quest. Activity : users can replay continually. Click the reserve ID button in the inspector to assign a unique id to your quest. The quest ID is generated automatically when you click reserve. Set the size to the number of quests that need to be completed before this quest is available. Hit 'enter' and that number of fields will appear. To each field, add the individual quest ID of one of the quests that must already be completed by the user. This allows you to have multiple quests initiated by the same quest NPC, in a series. Add the curator ID for any virtual good item you have uploaded. You can get this from the virtual goods component attached to the reward object (once it has been uploaded), or from the item list in your account at curator.sine.space. The reward virtual good object must be live before it can be given by a live quest. This button opens an Editor Window which allows you to build your quest, adding steps. Add the first step and reference the Quest NPC object (place the object into the Quest NPC field). You can add quest steps one at a time, building your story. Each time you add a step it will duplicate your last step. Open the Quest Designer Canvas. Clic Add Step button. You can delete a step within a chain; its child will be reconnected to the parent step. You cannot delete the first step. Click on the little arrow visible at the top left corner in the step inspector window. You cannot reorder the first step. If there are only 2 steps in your quest, you won't see the arrow from the second step. The NPC step type is mandatory for starting the quest. The step 0 will be of type "NPC" and you cannot edit it to make it a different type. 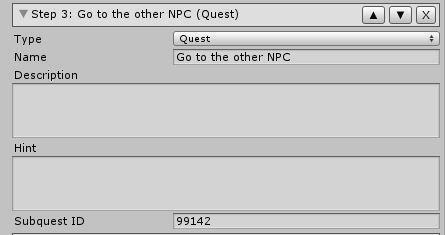 Other steps can be of type NPC: use a GameObject (or any object) and attach the Quest NPC component to it, placing it in the Destination NPC field. The activity step is a general step which you can use to deploy a wide range of activities which the user must complete before the next step initiates. You can drag any “Startable” component into into the Activity field in this step. The space quest system includes a range of standard startables you might want to use; for example, you might require a user to wear a particular clothing item or sit on a particular furniture item. For more information on startables go here. You can also write your own startables, which can be full game rounds or learning modules; the user has to complete each one before moving on with the quest. Tick autoplay if you want this step to start immediately as the prior step completes. If you leave autoplay unticked the user will need to click the quest NPC to start the step. You may need to leave the Autoplay unticked if your prior step is one that is registered as complete at the start of the step and the user will still engaged in an unrecorded activity before needing to move on. For instance if the prior step was an activity step using the StartableGestureRequirement, the quest system will register the user as having completed the step when they initiate a gesture but that gesture may take 30 seconds to play, during which you may not want the next step to initiate. The Replay Discussion NPC is the object in the scene the user needs to click if they have failed to complete the quest step. This may be because the quest step is a game component which can be failed; or a learning component with a passing grade. Or it may be because they logged out or were disconnected half way through the deployment of the startable. The replay NPC can be your original Quest NPC but if that is geographically some distance from the relevant quest step you may chose to put another object near the quest step activity which the user can click to restart the step. This can be any object with the Quest NPC component added to it, dragged into the Replay Discussion NPC field in the step. If you are using a navmesh to guide your users around the quest, the area hint will tell them where to go. It might usually be the same object as the Replay Discussion NPC but it can be any game object you drag into the field. Paste the ID of the child quest here. The visit location step requires the user to go to a specific place in your region to continue the quest. Drag any game object including any NPC into this field to require the user to visit this location before the quest continues. This step can be used in conjunction with the navmesh to lead them there via a visible path. Set the proximity in meters to the selected game objects. The collection step requires the user to click on and collect a specific game object in the scene. Add the Quest NPC component to the object you want the user to click on and collect. 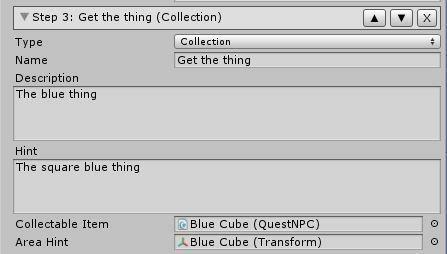 Drag the object into the Collectible Item field in the quest step. Make sure it has a collider on it so the user can click it. 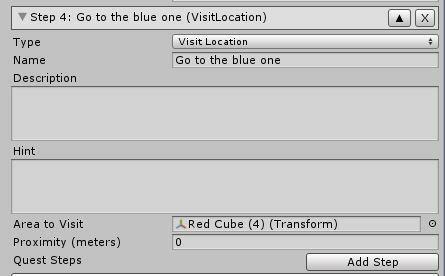 If you want the navmesh to lead the user to the collectible, you can drag it into the Area Hint field. If you want them to have to search without a hint leave it empty or add your original Quest NPC to guide users back to the quest area in the event they leave the region during this step. The counter step requires users to collect a defined number of counters. Use this step in conjunction with objects in the scene that have either the Quest Counter Clickable or Quest Counter Proximity component attached. You may also want to use the Startable Timed Counter which offers similar functionality to this step, when added to the Activity step, but on a timed basis. Specify the number of counters the user needs to collect. This can match the total number available in the scene or there can be far more in the scene than the required number, depending on the nature of your game. Add whatever ID you have manually applied to the Counter ID field of the Quest Counter Clickable or Quest Counter Proximity component attached to your counters. Use this in conjunction with the navmesh feature to guide people to an area, or drag your Quest giving NPC here to guide users back to the start of the step should they relog before completion. The conversation step allows you to build cut scenes in the quest, with successive combinations of dialogue, camera, audio and animation on the NPC and the player. To edit the conversation step open the Quest Canvas (from the button at the bottom of the quest chain in the inspector window). The conversation actors can be one or more NPCs and the play themselves. 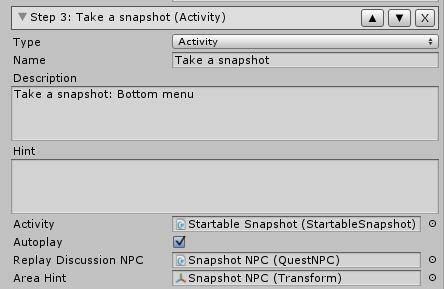 Add an actor and drag any object with the Quest NPC component attached to it to the NPC Object field. This will appear in dialogue panels during the conversation. Tick this to use the player as your actor. 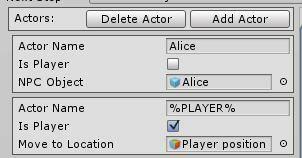 Add %PLAYER% to the Actor Name field to use the username in dialogue. Add an empty game object in the scene to this field to move your player to this location for the duration of the conversation. This allows you to align the player with specific camera shots defined by you during the conversation. Once you have defined the actors in your conversation you can add as many steps to the conversation as you want. Choose the actor narrating the dialogue step. Enter the text as it should appear in the dialogue panel. You can add an animation to the NPC or the player during the step. 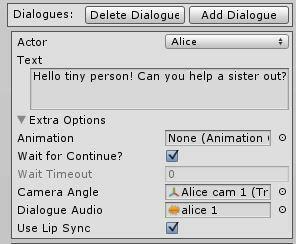 Tick this if you want the dialogue step to remain on the screen until the user clicks continue. 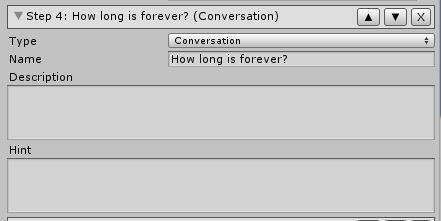 Define a time in seconds if you want the dialogue to end and the next to start automatically without the user clicking continue. Create an empty game object in your scene and position it so that it looks where you want the user's camera to look during the dialogue. You can position your view in the scene view in the Unity editor and then highlight the game object and in the top menu go to GameObject / Align with view to move the position and rotation of the game object to your view. You can add audio clips to the dialogue by dragging an audio file from your project to this field. Tick this if you want the mouth of the actor to be animated by your audio file. To use the conversation step you need to drag the Cutscene Dialogue Canvas prefab into your scene. This screenspace canvas displays the dialogue during cut scenes and offers the continue button to users if you are using that function in your dialogues. Make sure the Panel, which is a child of the Canvas, is disabled (the tick box in the top of the Inspector). This ensures the panel will only be visible to users during the conversation steps of a quest; left on it will be permanently applied to the screen of everyone in the region. Avoid putting the Cutscene Dialogue Canvas into a parent object, or if you do ensure the parent object is located at 0,0,0 in your scene or the canvas will be offset or invisible to the players. Branch NPC allows the user to setup several option for player to choose. It will lead to different quest steps based on the user's choice. Startables are components you can drag into the Activity step of a quest. You attach the startable component to the relevant game object; it some cases it might be an empty game object created just to house the startable; and then drag that object into the Activity field of an Activity type step in your quest. Add the Quest Counter Clickable component to counters the user must click on to collect. Enter an ID of your own creation to the Counter ID field and add the same ID to the Counter ID field of the Counter quest step or the Startable Timed Counter component. Add the Quest Counter Proximity component to counters the user must be within a certain proximity of in order to collect. Specify the distance from the object that will trigger a successful collection. This allows you to rez and and derez items in your scene during specified quest steps. It enables or disables the object it is on, based on whether the user is inclusively on any step between Min and Max. Objects can only be seen by the player. This will place an object at the origin of the avatar; 0,0,0 relative to that avatar, non-attached. To offset, place empty parent object with PlaceAtOrigin script and then offset visible object from invisible parent. Use in quest text fields to add player name to dialogue. If it's possible to fail an activity step drag the quest NPC into the “Replay NPC” field. It will show a "!" asking the user to repeat the step. Apply to NPCs designed to automatically accept gesture invites.